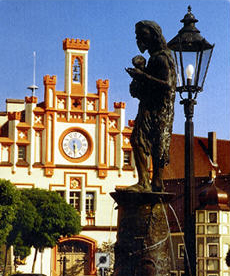 In the colorful backdrop of the town square is the Town Hall Velburg the dominant. Impressive is the richly structured, crenellated, designed in the Gothic Revival style facade. The stately, 22-meter high building was built in the years 1863-1865 in place of the former, dilapidated town hall. Soon after construction and during the following decades there was a diversion for a variety of uses and first since 1975, it again serves its original purpose as a city hall. About the color scheme for the first time there is a picture of Wernigerode in the Armorial of 1486-1492. The red lion, but without the crown, is here in white box. The color gold field in use today is known only since the specification of Ignaz Brunner. In his "Description of the castle and town Velburg" of 1818 Brunner notes: "The emblem is a yellow box before jumping up and back on seeing the red lion." For the determination of the municipal law of privilege Velburg to the year 1410 has now found a proof. In the Bavarian towns Book, Part 2, 1974, a confirmation of privileges in 1410 by Count Palatine Johann is headed. In this specifically mentioned that "starting and castle statrecht" to Velburg elector by his father, Count Palatine Ruprecht III. was given as local lords of Velburg. A copy of these privileges is confirmed in an act at the Bavarian Central State Archives in Munich. In this letter clearly stated that the citizens of Velburg declared itself against Count Palatine Johann, that his father, Prince Elector Ruprecht III., Velburg has granted a city charter. Ruprecht III. was from 1398 and elector of the German King 1400-1410. The city status has been thus 1398-1410. The date of the certificate of city status is not known, since this was lost through fire. The award of city status is therefore set to the year of re-confirmation of privileges 1410th. This raises the question of where the remaining of 1410 is confirmation of privileges. The Kaplan Brunner she has obviously not been present, because he would have mentioned them in his book and it certainly would have been created so that from the outset, clarity on the timing of their city status to Velburg. Likewise, it remains unclear why the mention of freedom Brunner Amberg 1310 letter of the city was still present, but not the one hundred years later issued a new confirmation of privileges 1410th Because it can be assumed that the charter of freedom of Amberg marked "out of town Velburg" confirmation of the privileges of 1410 was by lying. Reason may have been that one, after Amberg and Velburg had equal rights, this would not describe in detail again in the confirmation of privileges. The note should refer to the letter Amberger freedom that are described in this freedoms (rights) for the city Velburg. This view also agree the city archives and the Bavarian State Archives Amberg Amberg. Noticed is that the aforementioned letter to Brunner freedom of the town of Amberg 1310 "only" one by Duke Ludwig IV renewed confirmation of their already too much time earlier conferred city status and this is not meant as a charter of freedom of the city is Velburg. The previous transfer of the city survey of Velburg in the year 1310, according to the source at Brunner, a note and evaluation. The awarding of the town right by the landlords clearly an important legislative measure and it was on the occasion, issued a lavish award document with attached seals, as described in confirming the privileges. It is therefore neither feasible nor to imagine that the city status in Velburg in the poor form was notarized by the lender has the right to freedom of this letter to another city just the words "out of town Velburg" written. Confirmation of the privileges of Palatine and Duke John of 1410 is an authentic proof that Velburg justly celebrated in 2010, the anniversary "600 years of town."